I had a weekend filled to the brim with so much stuff and yet no photos to show for it. It happens. I did snap a picture of my quick Saturday evening manicure (that I’m still rocking on this Tuesday). I grabbed the Kermit the Frog OPI glitter polish (Fresh Frog of Bel Air) on a run to the beauty supply place over the weekend. That green sparkle was calling my name. I decided to do a little dipped glitter looking manicure. I used a neutral as my base (OPI ‘Did you ‘ear About Van Gogh?’) with the glitter on just the tips. 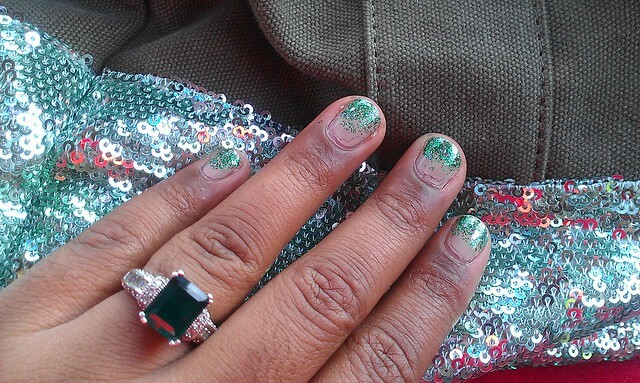 It was fun and different and it paired quite nicely with my green sequin bottom Deux Lux satchel. This long weekend I had a brunch date with my husband, a sleepover with my cousins (and lots of homemade goodies), dinner with my family and outlet shopping with my girlfriends. Can I tell you the best bargain I got at the outlets was $8 Maidenform bras?! Yeah, I was entirely too excited to refresh my underwear collection, but man did I need it.Sometimes a good outlet trip to get essentials at great prices is all you need to make your day. Of course I’m now exhausted from my weekend running around. Oh well. Did you do anything fun this weekend? I love ombre glitter nails- yours look great!